Our Logitech Harmony One remote and PS3 adapter arrived today | Tales From The Ipe! Since July, we’ve been fumbling with 3-4 remote controls every time we want to watch something. Here we are with all these great components, but it’s so annoying to change the channels or raise/lower the volume. Want to watch television? 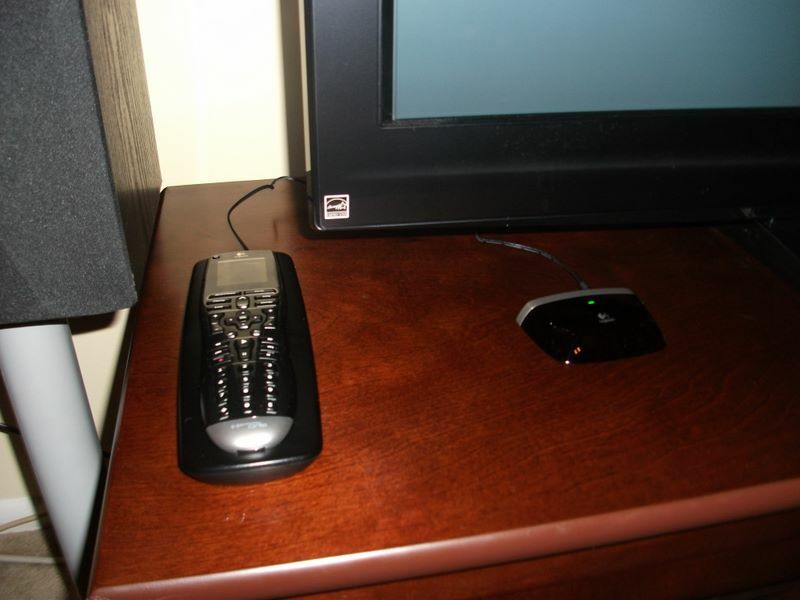 Two remotes — FiOS DVR remote, Panasonic TV remote, and stereo sound. What to watch television with surround sound? DVR, TV, and AV receiver. Want to watch a movie? DVR, TV, AV receiver, and PS3 controller. BTW, it’s weird to watch a movie using a PS3 controller. I don’t know if I’m trying to fast forward or sniping someone from a tower window. My wife can’t stand tryng to watch a movie, being unsure if SQUARE is to stop, or L1 is rewind, etc. We knew we wanted to get a universal remote, but it’s a bit pricey. The Logitech Harmony line of universal remote controls get good reviews, and I’ve had my eye on the Harmony One remote. It’s supposedly easy to configure(programmed at your home PC), and there’s even a Harmony PS3 Bluetooth adapter so one can control a PS3. All that goodness comes with a $200 price tag, so my wife has been a little reluctant. Rightfully so, since it’s expensive proposition, but the value is there. Last week, we’d finally had enough, and my wife actually ordered it. My wife, God bless her, has a high tolerance, but she readily admits it’s a bit of a pain to watch a movie. Plug in the remote control cradle and the PS3 adapter so the remote can charge for a bit. Install the software on your home PC. Configure what actions to take, what inputs to change to, what isn’t used. Plug in the remote control via USB cable so the configuration can be transferred over. Bonus — On your PS3, register your Bluetooth adapter. That’s all there is to it. I’ve noticed one hiccup on the changing of the television inputs, but I’ll figure it out. When you hit “Watch TV” for example, it’s supposed to switch to HDMI1 or whatever. A few times today, it was on the incorrect TV input instead, and I’m not sure yet. There are also some additional remote options/controls on the touchscreen portion of the remote. I’m wondering if I can configure those as well. Again, I’ll figure it out. So far, I like what I see. This entry was posted in Technology and tagged harmony one, logitech, playstation 3. Bookmark the permalink.